Out today in Europe, SEGA and Platinum Games' Vanquish is, quite simply, one of a kind. It's a joyous celebration of the shoot-'em-up genre that combines state-of-the-art rendering technology with excellent artwork and slick gameplay that turns routine destruction into nothing short of a work of art - and best of all, the player is the artist, crafting his own spectacular combat set-pieces backed with what is one of the most satisfying implementations of bullet-time seen since the effect transferred across from the silver screen. Ultra-contemporary in many ways, Vanquish also has an old-skool heart, with a unique style that harkens back to the early days of the 16-bit console era where Japanese games had a look, a feel and a polish level that eclipsed the best that the West could offer. In the present day, where many shooters appear to be defined by gritty realism and visuals based predominately on shades of brown, Vanquish's slightly corny sci-fi setting also serves to inject some old-fashioned fun back into a genre that perhaps takes itself a touch too seriously. Vanquish is the best fun I've had in ages and well worth its 9/10 Eurogamer review score. The only question remaining concerns whether the unstinting praise applies to both PlayStation 3 and Xbox 360 versions of Platinum Games' latest release. The studio's last title, Bayonetta, didn't fare quite so well on the PlayStation 3 - SEGA commissioned a team to port over Platinum's 360-optimised code, resulting in a release that even the PlayStation Blog describes as having "technical issues". Platinum's response has been to develop Vanquish firmly as a multi-platform project that leverages the strengths of both platforms, but perhaps because it was the studio's first in-house PS3 title, the Sony console was designated "lead platform". Based on our analysis, there are differences between the two games, they do undoubtedly favour the PlayStation 3, but this is no repeat run of Bayonetta - no matter which console you might happen to own, it's a must buy. We'll kick off, as usual, with the comparison movie. What we are doing here - and in the majority of our head-to-head vids - is to capture the entire 60Hz output of the console. Internet streaming video is effectively limited to 30FPS, so rather than dump half of the machines' output, we slow the vid down to 50 per cent speed instead. Combined with hand-encoding the final MP4, this also allows us to retain maximum quality while at the same time providing a working streamable vid. Remember to use the full-screen button for full HD resolution, or else use the EGTV link for a larger window. In terms of graphical differences between the two games, it's fair to say that there aren't any of real significance - certainly nothing that might affect a purchasing decision: both run at 1024x720 resolution with 2x multi-sampling anti-aliasing (MSAA). 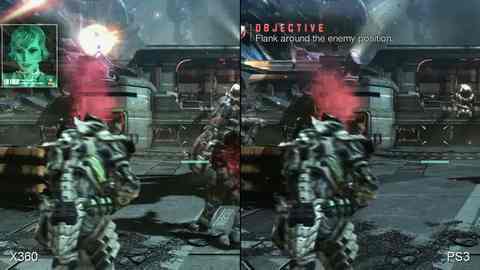 Vanquish is a spectacular-looking game that throws out an astounding assortment of effects and the overall look is exactly the same on both platforms. Just about the only issue we did notice on a consistent basis was a difference in shadowing, which seems to favour PS3. In these shots you can see shadowing that's either omitted completely or else suffering from "shadow acne" on the 360. The only really noticeable difference between the two versions comes down to the implementation of shadows. What appears to be an offset bias issue adds 'acne' to some areas of the 360 game, and looks to remove some shadows in the distance altogether. The fact we see these differences at all is somewhat bizarre but it does suggest a slight difference in shadow offset bias, something that we have seen occasionally on other titles (Final Fantasy XIII on Xbox 360 perhaps being the most extreme example). In all other aspects, the two versions are effectively a match. We compared a range of comparison shots from across the game and saw nothing to suggest any real differences in artwork quality, aside from one rogue screen that demonstrated higher-quality texture LODs on the Xbox 360 - most likely an aberration bearing in mind that nothing else could be discerned from any of the other shots. Overall, texture quality is a match, as evidenced by the top screen. On the lower set of comparison images you find the one 'rogue' shot where texture LODs were less aggressive on 360. Realistically, however, these games look exactly the same during the run of play. Good luck getting through God Hard now! And it's out this month.